Furman Biology professor Dr. Alison Roark with student Parker Murphy in the Furman labs. 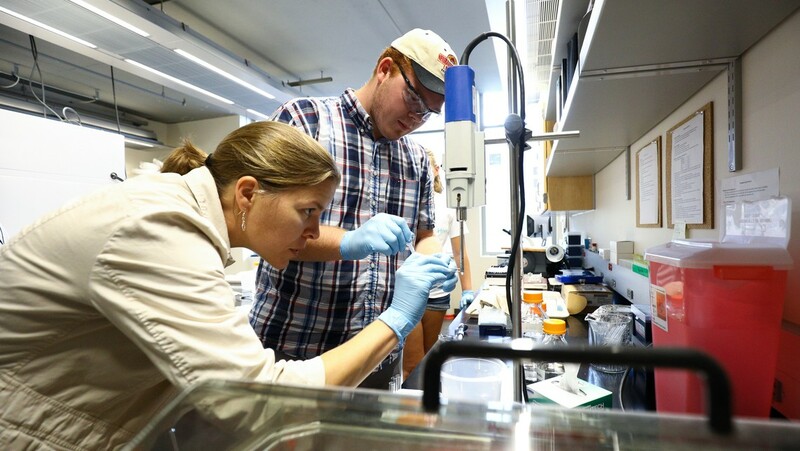 GREENVILLE, SC (courtesy furman.edu) — Three Furman University Department of Biology faculty members have each received research grants of $72,000 from the South Carolina IDeA Networks of Biomedical Research Excellence (SC INBRE) program for the 2018-2019 fiscal year. Dr. Dubash’s 2018-19 SC INBRE-supported research is related to Furman student Jacqueline Bendrick’s work on “Desmoplakin Promotes Cell Migration via Coordinated Control of p38 MAPK and RhoGTPase Signaling“, which received 2017 funding in the SCICU Undergraduate Student/Faculty Research Program. Bendrick presented the results of her 2017 research at the 2018 SCICU Research Symposium at Milliken & Company headquarters in Spartanburg on February 22, 2018. Highlights from the 2018 SCICU Research Symposium may be read here. For more information regarding Furman University research programs, please contact Furman’s News and Media Relations office at 864-294-3107 and vince.moore@furman.edu. For more information on SCICU funding support for student research at its twenty member colleges and universities, please see scicu.org. The 2019 SCICU Research Symposium is scheduled for February 21, 2019 at the Milliken & Company RMC Campus Customer Center. Funding opportunities are available for supporting SCICU student research. If you would like to support student and faculty research at SCICU’s twenty member colleges and universities, please contact Eddie Shannon, SCICU Executive Vice President, at 830-799-7122 or eddie@scicu.org.